In my mid-twenties, when I was sojourning in the Democratic Republic of Congo, a great man told me “Once you drink the water in Africa, you will come back again”. I had little or almost no idea of what those words meant when they were being uttered but on the 3rd of September 2016, those words echoed again in my mind and they began to make sense. I was in Zanzibar – an extraordinary island lying off the coast of Tanzania and teeming with its historic heritage, intricate architectures and rich culture. The boat trip from Dar es Salaam was long but not boring as the endless blue ocean was a real feast to the eyes and a deep source for contemplation. After almost three hours of boat ride, Zanzibar showed itself in vivid detail. The moment I walked through the Zanzibar Ferry Terminal, I felt that the island had a unique and artistic character of its own, and this became evident as I explored the island. Zanzibar is an island of contrast and art. Some streets were occupied and disorganized while some were devoid of commercial activities and people. The locals were welcoming and seemed to be proud of their country. They have all the reasons to feel so. I pursued the enriching walk and noticed how people were engrossed in their own activities. I saw a young man immersed in reading the newspaper by the side of the road. Nothing appeared to be disturbing him; neither the noisy horn of vehicles nor the giggles of the college students. Not too far away, I saw three elderly men engaged in a conversation by the side of a calmer road. The most impressive and distinctive aspect of the island is how well it has kept its history alive through its prominent structures and architectures; boasting themselves in the lap of the Stone Town. The paths between the old buildings were narrow and the cables were hanging loose all over the building. I was flabbergasted by the wooden carved doors. I walked close to one of the doors and placed my hand gently on its surface that has turned rough over the course of time but that still bears testimony of the colonization era by the Arab traders. I toured around Stone Town for almost an hour until I arrived at the Al Johari hotel. Al Johari is a decent hotel but one should not expect good internet connection in the room as wireless internet connection was available only at the restaurant located on the last floor of the hotel. But Zanzibar is so breathtaking that having internet connection in room will be just a trivial concern. There’s so much to see on the island. After a long day touring around the island, the view from the hotel’s restaurant soothes the soul. I spent two unforgettable days of my life on this island. One is bound to fall in love with this piece of heaven resting peacefully in the lap of the Indian Ocean. From the busy shores of Dar es Salaam, the Zanzibar archipelago is a luring dream in the eyes of insatiable travellers. After sojourning in the heart of Dar es Salaam for a night, I filled my light brownish backpack with a couple of clothes, a travel journal made of recycled paper, a black pen and a compelling book, hanged my Nikon D7000 around my neck, slipped my GoPro into my pocket and headed to the ferry terminal of Dar es Salaam. It came as a surprise to me that the immigration procedures weren’t lengthy at the ferry terminal in Dar es Salaam in spite of umpteen travellers. As I glanced around to study the surrounding, I saw people of different nationalities; some absorbed in long-lasting conversations, some sleeping on their chairs and others staring emptily around. Beside passengers, I saw few vendors walking around the terminal with baskets filled with assorted snacks and drinks. If you ever travel through this terminal in the future and in the hurry of departure, if you fail to eat your breakfast or lunch, you can rest assured. The assorted snacks and drinks can easily be found outside and inside the terminal, and the prices are reasonable. In the wait for the boat, I switched on my laptop and exuberantly browsed through some pictures which I took a day before. Meanwhile, dad was filling the entry declaration form for custom processes in Zanzibar. After an hour’s wait, the cheerful staffs at the terminal began instructing all the passengers to line up for the boarding. I stepped into the line too and gradually walked to the boat. I was struck by the the beauty, size and comfort of the boat. I smiled as I recalled the time spent in choosing the mode of travel from Dar es Salaam to Zanzibar. At the first glimpse of the boat, I felt a tinge of happiness for having made the right choice: a boat trip instead of an air trip. As we settled in, the boat began sailing off the coast of Dar es Salaam. Two minutes elapsed and I could not move my eyes off the shore; distancing itself from me. I plunged into my thoughts and felt grateful for all that Dar es Salaam taught me. Two hours. This was the time it took us to reach the Zanzibar archipelago but in these two hours, I learned many things. The boat was spacious and comfortable inside. There weren’t too many activities inside the boat. Some passengers seemed so exhausted that they seized these two hours to sleep and some were tirelessly gushing about the splendour of Zanzibar. I found some passengers on the deck of the boat too; lost in their thoughts and admiring the deep blue ocean. I walked to the deck too and after some time, dad joined. I looked around me. There were no boundaries. I saw the horizons where the sky seemed to be kissing the ocean. Everything was so peaceful. Everyone was so absorbed. I saw few small boats sailing in the lap of the ocean. I felt freedom. I felt I was still a child at 28 and I smiled. I felt discovery in my eyes. I felt adventure in my heart. Gradually, Zanzibar came into view and that moment, I knew everything would be different. I knew some stories were waiting for me at the shore. I knew and I was right. In the course of my travels, I have been to numerous places; each of them proving me how wrong I was about them. A couple of years ago, I knew nothing about Zanzibar but this trip made it part of me. An important part. “One day, I will walk to these places again to feel who I was once” I whispered this sentence as I stepped out of the breathtaking Mahakali caves. Monday, 16 March 2015. I cannot forget this date. I was sitting clueless in my room; in Hotel Comfort Inn, situated at Jogeshwari West, Mumbai. The clock was ticking and time was running out. I had no plans and no idea about where I should go or what I should do. I was alone; trying to figure out how to do justice to my adventurous spirit. The solution didn’t take too long for the bell to ring in my mind. I grasped my mobile phone, connected to the internet and typed in these keywords: Attractions in Andheri. The search results were endless but amidst all the attractions, I felt the divine urge to explore the mystical Mahakali caves located in Andheri East of Mumbai. Centuries back, this Buddhist monastery served as cells for monks. I traveled by a rickshaw from Jogeshwari to the Mahakali caves. It took me approximately 25 minutes to reach there and the fare didn’t exceed INR 150, but it’s advisable to keep an eye on the meter. You cannot completely eliminate the risk of some cunning tampering with the meter. There is no entrance fee to visit the caves. The place was neither crowded nor were there tourist guides to pester the visitors. At first, I hesitantly walked in but I quickly felt settled and allowed my sheer curiosity to drive me. I could feel the profound silence of the place; cradling me in its divinity. I leisurely walked around; trying to visualise how this place could once have been. I’m pretty sure that even my imagination failed to depict its past splendours. 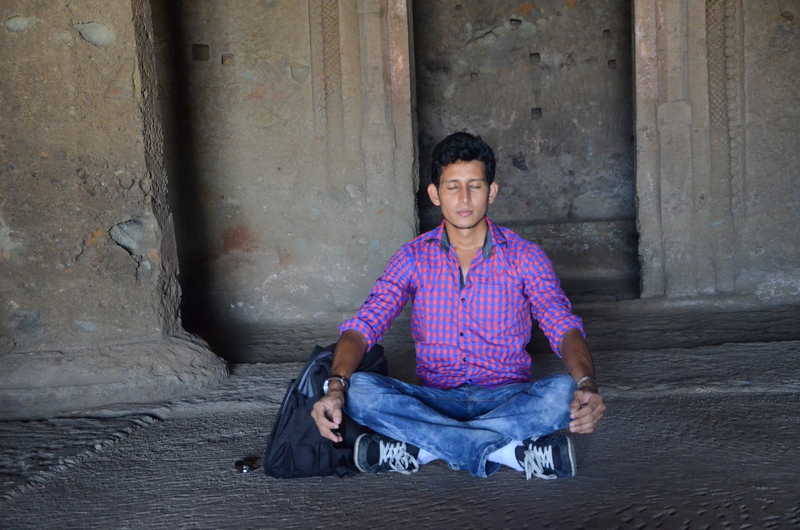 To be one with the holiness of the caves, I proceeded to meditate for some time; something I’d recommend you to try too. The serene ambience blends with the undisturbed silence of the caves; rendering it ideal for meditation. Travelling is not exclusively about crossing geographies; it’s more about transcending our deepest fears and confusions, while being at peace with who we are deep inside. If you are in Mumbai and you wish to pursue a transcendental adventure, in a place tucked away from the hustle and bustle of every day life, then do not think twice: Mahakali Caves is the place. Travelling isn’t about the miles we cover with our vehicles; it is the miles we cover with our soul. On Wednesday, 6 June 2016, I woke up with no plan for the day and ended up trusting the road to guide me. Tank filled with fuel, oil level verified and tire pressure checked; I embarked on another adventure into the unknown. This time, I wasn’t alone. I was accompanied by two like-minded brothers, who added the sense of humour to the trip. “Where are we heading to?”, asked one of them curiosity in his eyes. “The road will answer this”, I replied cheerfully. The enthusiastic chit-chatting began to die as time flew by, and as lethargy permeated in the air, no voices could be heard coming from the back seat. Uneven rumbles of the tyres on the road surface and the soft music in the car, were all that could be heard. After almost an hour’s drive, we travelled through a road lined with green trees on both sides; as if it was the road to paradise. I did not pursue the trip any further until I took a walk down the street. The air was filled with the scent of the wild herbs and flowers. The spectacular scene of the light beams piercing through the green foliage was a real feast to the eyes. My brothers and I, we are usually high-spirited but we can also become very quiet too. They could not resist the scene either. While they were happily capturing some pictures of the place which turned out to be jaw-dropping, I was silently walking down the lane. The wild flowers bought me somewhere in their world and made me think. Trapped in the clutches of wild shrubs and plants, they could have yearned for squishy soil to grow but they choose rather to blossom in their own little ways. The wilderness keeps stifling them but they keep forgiving the trees, the shrubs and the herbs for robbing them of their spaces and composure. As I was contemplating on making sense of the little things around me, my brothers too accompanied me in the walk; speaking less and living more. We refilled our energy reserves and continued our adventure. Few minutes later, Dubreuil came into view; a green village tucked away from the hustle and bustle. I feel deeply connected to this undisturbed part of the world because some chapters of my childhood were etched here. I still remember the tales from Dubreuil. I used to spend sleepless nights listening to the scary and spooky tales narrated vehemently by my aunt. The innocent and playful walks in my uncle’s farms are still vivid in my memory. I could not explore Dubreuil without visiting them. After some time spent with them, we set off again and keenly drove through the tea fields surrounded by silent hills and neatly trimmed tea plants. The scene was to die for. The narrow pathway leading to the field was covered with mud but this did not prevent me from venturing inside. I stopped the car and took a walk in the lush green fields despite the muddy paths. It sounds exciting but one has to be careful as the risk of slipping is high in such places. While touring around, I found some wild raspberries hiding away beneath large guava leaves. I could easily distinguish them by their leaves and consumed a handful of them. I must admit that they are not tasteful but nevertheless, they managed to quench my light hunger at that time. The journey continued; from picking raspberries to basking in the country’s glories. I have too many stories but too few words to narrate them. Dreams; I have many and one of those cherished dreams is to journey across the world, connect with people and their stories, and feel their cultures. I never thought I would travel so intensively at this tender age, but it is happening and I am utterly convinced that there is no greater magic than this. It took me hours to travel from Agra to New Delhi, by road but road trip is the school of life and few hours can impart to travel enthusiasts years of wisdom. On arriving in New Delhi, I was left stunned by how colorful this city is. The colors of the buildings, of the temples and of the markets are so vibrantly contrasting that momentarily glancing at them would do injustice to their prestige. I walked through the streets of this city and looked carefully at everything around me; wearing a smile on my face. The noise of the place had no power to divert my attention because the power of city captivated my heart at the very moment I stepped in. On walking around and capturing the wonders of the place, I met a snake charmer and indulged in a conversation with him – appreciating his journey of life. Without any hesitation, I requested for the snake to be placed around my neck for a picture to be taken and so far, this remains my best memory from New Delhi. We create our own stories and without undertaking risks while journeying, we create only stories; not great stories. I could have chosen to snuggle in my blankets with some books; reading about the journey of war-torn or democratic countries. This would have led me to appreciate the history, culture and vision of a country but I doubt if pages of a book could do justice to the spirit of a country. Undoubtedly, this is why I choose to travel – from the thickest slums to the richest cities of the world. I never knew travel could touch the deepest chords of my heart and instill in me a sense of purpose. In the course of my voyage, I seek to feel the spirit of places and people while I seize the privilege to encourage people to dream bigger. This is something you cannot accomplish with your mind delving deep into the soul of a book; though I acknowledge that books can do magic too. While many people travel largely for fun, I travel fundamentally to learn, to contribute and to become. I have a preference to uncover the depths of places rather than their lengths. This is why, in March 2015, I chose Mumbai as my central destination though people told me to consider other travel destinations for countless reasons. Proving them wrong was not my intention; I was just an ardent traveler willing to walk off the beaten path and to bring exclusive stories from the different parts of Mumbai. Deep inside, I remained convinced that each and every city has their distinct beauty hidden beneath their scars. Lonavla, also known as the jewel of the Sahyadri Mountains, left me flabbergasted earlier this year and this is why I decided to come again but this time, for a road trip all the way from Mumbai. The road trip is usually estimated to last for approximately three hours but it offers so many photography opportunities that I had to stop again and again to do justice to the voyage. It thus took me around four hours to cover the distance with frequent stops. The road was generally good and the scenery was to die for. On my left side, stupendous views of green-garlanded mountains captivated my soul to such an extent that I found it difficult to even blink my eyes at the same pace I used to. Wide geographical areas were covered with colorful flora and they would rest peacefully in the lap of nature. On my right side, I saw the chain of rocky and sun-baked hills with naked peaks. The more I travelled, all civilization vanished and an undisturbed silence settled in. All I could hear was the sound of the breezes; seemingly giving company to the mountains. I left no stone unturned in feeling the spirit of the places and of the locals. Whenever I would pass by an exquisite viewpoint, I would stop to contemplate on the scenery and the tranquility enveloping it. It soothes the soul. If you are fascinated by this too, some degree of precaution is desirable because Lonavla is home to thousands of monkeys and they can surprise you anytime. I had some encounters with them too and they behaved gently though they could not cease staring at my camera. I chose not to complicate things and I just captured that moment through my lens before moving on to pursue more adventures. I then approached this gentleman who was selling fresh juice by the roadside. He felt rather pleased to have been photographed on that day and on promising him that I would share his picture on my travel blog, he was even more delighted. I seized the opportunity to question him about what he loves most about his job and his answer was the privilege to serve people by quenching their thirst. I overtly walked with a herd of calm sheep on the road of Lonavla. People looked at me twice for it is not something, I presume, the locals would take pleasure in doing but I marched ahead smilingly and confidently until the locals were not surprised at the scene anymore. While venturing to places like Lonavla, I highly recommend you to bring extra battery along with you for your camera as there are so many things to capture on the way – from the famous Chikki shops to lovely temples hiding in the greenery. Take as many pictures as you can of all the things around you. People and places in the pictures change but the pictures do not and this is the beauty of travel photography. Later in the evening, after spending a reasonable amount of time digging into the culture of Lonavla, I visited the Celebrity Wax Museum. It is located on the Old Mumbai -Pune Highway, Lonavla. The entrance fee is Rs. 150. The museum has a good collection of wax statues of many celebrities including the Great Gandhi and Narendra Modi. I spent not more than an hour inside; taking pictures and reading the brief biography of the personages. I have been a little funny too. The picture says it all. I then travelled to the hilly areas of Lonavla, which is a main tourist attraction too. The local guides and shopkeepers will pester you until you surrender to either hire a guide or taste the local dishes from one of the small restaurants. I do not surrender easily though and if ever I do, then it is not a submission; it is a choice. Local guides have a hard time with me. I do not have the habit of refusing twice. If I feel pestered, I will honestly but nicely express what I feel. This is something you need to excel at if you intend to travel the length and breadth of a place – managing people around you. I met this little boy, wandering around the restaurants. He walked to me and requested me to eat something at a particular roadside restaurant (commonly known as Dhaba). I kindly declined as I was not too hungry and instead, I taught him some basics of photography from the little I know about this art. He felt tremendously inspired at that time. Not far from the restaurants, there was a space dedicated for camel and horse riding. I could not miss the camel ride there. It is not something I am fond of but I was not cruel either to the animal. It costed me less than Rs. 50 for the camel ride that lasted for around three minutes only. I wonder if a sunset can be tasted but so far, I smelled and heard it on the peak of Lonavla Hills. The sun dipped gradually leaving behind hues of countless colors in the sky; this made the heat smell differently. I could hear lesser human activity and lesser chirping of birds. I looked at the landscape and felt how much love there is between the colors of the flora and the flora itself. Though they are conscious that they have not been promised a lifetime bond, they still dare to love secretly and sincerely for love does not confine itself to relationships. On travelling down the hill, I passed by a small village.I thought I would see little wrinkled old ladies sitting crossed-legged outside of their huts and mischievous children playing around. I rather came across a scene completely contrary to what I initially had in mind. It was that of some locals toiling the land and picking stones as part of a major construction that was going on in the village. A lot of activity was going on the site. As I walked in the village, they would all look at me inquiringly but some minutes later, I was warmly accepted by the villagers. There is a magic in being quickly accepted – it is the magic of empathy. If people accept me quickly wherever I travel to, it is entirely because I place myself in their shoes and feel what they do. That’s all. While continuing my exploration in Lonavla, I met this gentleman who owns a pottery store by the roadside. The store comprises of a huge collection of colorful pottery products. It’s a feast to the eyes to gaze at the store from outside. It blends so harmoniously with its location – surrounded by green trees and other pottery stores. On my way to Khandala, to admire the sunset from one of its famous viewpoints, I could not resist the spicy roasted corn (commonly known as Bhutta). Beside spices (masalas), lime juice is also sprinkled on the corn to make it tastier. If you ever decide to visit this beautiful part of the world, don’t leave without eating the Bhutta. On eating the spicy roasted corn, I had some reminiscences of Kenya. I remember having eaten roasted corn by the roadside while road-tripping from Nairobi to Naivasha some years back. And then, the day drew to an end with a soulful contemplation on the sunset at Khandala. Even if I write millions of words about my road trip from Mumbai to Lonavla, I will remain doubtful as to whether my words have done justice to what my soul has truly felt. Road trips never lie. They teach even beyond books.